So easy when you know how! You can take trial and error straight out of your vocabulary with Jumpstart's clear, easy lessons. 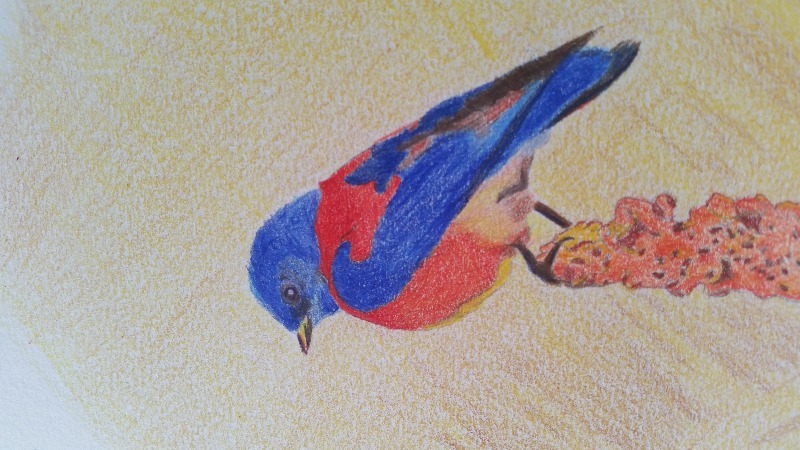 Though it may look difficult, this Bluebird lesson will show you how to build color, shade and simplify subject matter. Only these 13 colored pencils needed! So let's get you Jumpstarted - with simple instruction from Dan Miller that includes what kind of stroke to use and how much pressure to use in each and every section. Even a novice will learn the ropes in a flash in these 10 easy steps. This is a very good book. Dan Miller is a very talented artist. This book is well written and well illustrated. At last a tutorial that gave ALL the instructions needed to explain techniques etc. Thoroughly enjoyed the process of producing a lifelike subject. Thank you! Step 8, complicated. My wife is a newbie. Words like 'negative' and 'vignette' is ? Simplify the wording. Rewrite step 8 and you have a Five Stars. We appreciate your suggestion on the re-wording. We do apologize if it was too advanced for your wife. Negative space is simply the space that surrounds an object in an image. A vignette is when the color gradually starts to fade, so as not to create a definitive line on the border of your artwork. We would be happy to exchange this kit for another one, if you would like? Just let me know - you can email me directly at: orders@annkullberg.com and I will get you taken care of.